Klaudius is from Munde, a small village on Flores in the East Manggarai Regency, and is a graduate of the Flores Tourism High School. 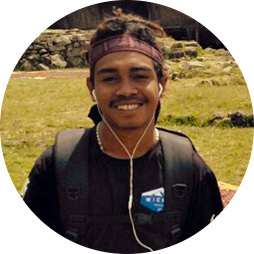 Klaudius moved to Labuan Bajo in 2013 for Wicked Adventures’ seven-month guide internship, made possible by Wicked Good. During this program, he was trained in overland guiding, kayaking, diving and customer service. As a Tour Leader, Klaudius enjoys meeting and learning from guests, having opportunities to improve his English, and, of course, to explore so many amazing places. One of his favorite places to date is standing atop Kelimutu at sunrise while admiring the crater lakes and listening to a symphony of birds. Klaudius is passionate about self-improvement and family. He is thrilled to be a part of the Wicked Adventures team and looks forward to continued personal growth and a bright future in adventure travel.